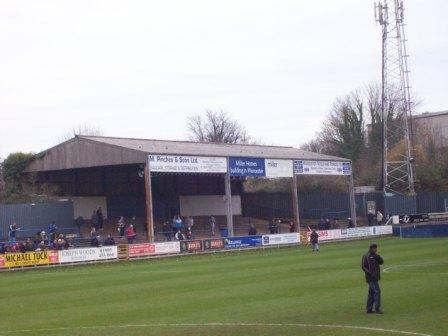 St Georges Lane, home of Conference South side Worcester City, was a bonus ground for me. It wasn’t one I had earmarked for the next season or two, nor one I’d ever given much thought to before. My Dad was up for the weekend though. He is an AFC Wimbledon fan and they happened to be away at the reasonably local Worcester in the FA Trophy, a mere 70 miles away down Ms 6 and 5. It’s normally me that chooses the obscure non-league venue to go to when he comes up, normally one I’ve been casing for a while; so it was nice to be landed a totally unexpected one – like a rare guest beer in a local pub. 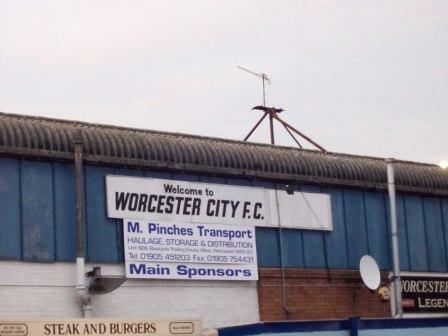 Worcester City have a fine non-league pedigree – they were founded in 1902 and after playing in the Birmingham & District League joined the Southern League and then the Alliance Premier in 1979. They stayed in non-league’s top flight until 1984/5. Due to their location they were moved from Conference North to Conference South this year. Their greatest moment though, was beating Liverpool in the FA Cup, 2-1, in 1959. AFC Wimbledon’s history is quite well known by now, and they are flying high in the Conference South after promotion via the play-offs last year. They lost to Worcester in the league earlier this season, somewhat surprisingly, 3-2; having been 3 down after about 20 minutes. St Georges Lane was a bit of a surprise to me. I had envisaged something modernish beforehand but, if you forgive the cliché, entering St George’s Lane was like stepping back in time. I was very surprised to find out afterwards that it is only 53 years old. It is a massive ground for non-league, and I got the sense that since its opening it may have been encroached on somewhat, lessening the capacity. The official capacity is 4,850, but that has got to be the biggest understatement in stadium history. It is easy to imagine their record crowd of 17, 042, against Sheffield Utd in the FA Cup in 1959 (this was the next round game after beating Liverpool), fitting into the stadium. You could fit the 4, 850 just on the side terrace alone and still do a star jump without hitting your neighbour. 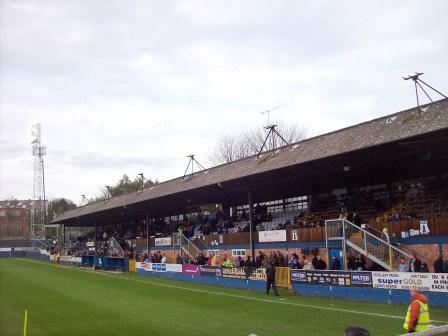 The bottom part, known as the Shed, has a massive roof on it and certainly looks unchanged since the 50s, when even non-league grounds were huge. There is a big old ornate seated stand opposite with 1,300 seats that reminds me a lot of the stand at Chesterfield’s Saltergate. Away fans were segregated for this tie – whether that is normal or whether it was just because a large AFC Wimbledon contingent was expected, I don’t know. The Wombles all stood on a tapering terrace known as the canal end, again reminding me a bit of the away end at Saltergate. There were a few hundred Wimbledon fans that made the journey. The other end, the Dressing Room End looked like it was just a flat walkway behind the perimeter bar. St Georges Lane is fairly central to Worcester, just north of the centre and the train station. Not having researched the pubs beforehand, we stopped at a pub, thinking it was probably the last one before the ground. It was uninspiring and sold no proper real ales. We were disappointed to find a much nicer looking pub right by the ground! Entrance was £10 which is about what I expected but the programme was fiendishly overpriced at £2 – it looked like something from the eighties, a slender bromidic affair entitled ‘City News’. As I said, St Georges Lane had the air of being unchanged in a good while. One could almost imagine men in long shorts coming out, with Kenneth Wolstenholme on the tannoy in his clipped BBC tones. It did look in a state of disprepair and I have since learned that it may be set for demolition soon, in favour of a 6,000 seater new stadium on the edge of Worcester. 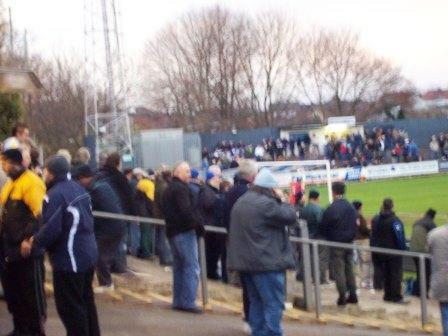 It will be a shame in a way, because while St Georges Lane seemed a little too large for Worcester City, and had difficulty generating much atmosphere, it is a great piece of football history and deserves keeping in some respect. The memory of their giant-killing defeat of Liverpool and 17,000 souls packed in to watch a 4th round cup-tie still linger palpably in the rafters of the Shed and in the roof of the main stand, sharing a space with some pigeons now, no doubt, but there nonetheless. The game wasn’t a classic, but obviously my Dad was pleased with the deserved win for AFC Wimbledon. They looked the better side for much of the match with Worcester unable to show much inspiration for a fight back. This entry was posted in Groundhopping, Non-League, Travelog and tagged afc wimbledon, Non-League, old grounds, worcester. Bookmark the permalink. 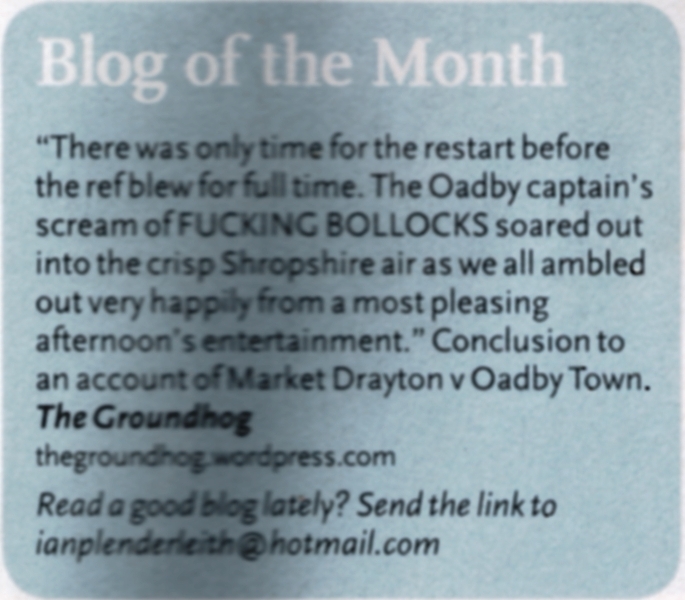 i came across the review of your trip to Worcester in November 2008. Obviously that’s a while ago now but I wanted to take issue with your comments about the programme, as i was the programme editor last year. Bromidic is defined as”Stale, trite, or commonplace through overuse” and I found your description way off the mark. you would never have found a full colour programme in non-league football in the eighties for a start, even today that is rare at Blue Square South level. 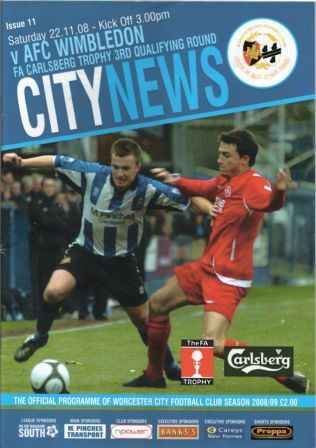 The B5 size and £2 price tag are commonplace amongst clubs at our level and although the programme last season only had 32 pages, there were 20 pages of editorial and 12 adverts, with very little space filling through large font size, reproducing articles off the internet etc. Looking at the programme from the game you went to, all the items were original apart from the Visitors’ pages and a page on the history of the Trophy. Even on the AFCW pages I avoided repetition by including action photos from their game at Worcester the previous month instead of the same team pic as before. Beauty is always in the eye of the beholder but as I said, your comments were way off the mark. Anyway, glad you enjoyed visiting Worcester and maybe you’ll come agin one day. I owe you a huge apology. I’m really sorry if my remark caused you any upset or hurt. You are completely right to call my words ‘way off the mark’. At the time it was a throwaway comment and I realise now, from digging out the programme, that it was based on nothing except that its appearance reminded me of my old 80s Brighton programmes. I was wrong to give it so rude and brief a summary. I often talk about the homogeneity and high price of league and upper non-league programmes, but why I decided to vent spleen on Worcester’s, I really don’t know.You certainly didn’t deserve it. I have every respect for the individuals (like yourself) who volunteer their time to do things such as programme editing and general helping out with the smaller clubs. Without people like you these clubs would not exist and be so well run. It was careless of me to make a cruel remark about your work. Having dug it up and looked inside properly, I can see that you’re right in that there are lots of unique and interesting articles and it certainly isn’t bromidic. As for the price, I will accept that it is standard for your league. You will know this better than I. Thank you for pointing it out. It will certainly make me more aware in the future of what I write and to back up any criticism with hard facts and not just make brief cutting remarks. Please accept my apologies once again and rest assured not many people read my blog! I’ll amend the original text with a fairer summary of the program.